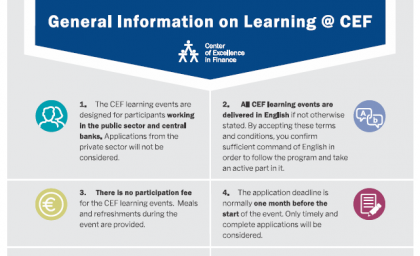 Please note that by submitting this application you confirm that you have read the General Information on Learning @ CEF. Do you need VISA to enter country of event location? INSTRUCTIONS:Take sufficient time to fill out the form as the information will be used as the main selection criteria for participation in the event. Please carefully read event objectives and target audience description. Please include in the description your current job duties for which the event is relevant and beneficial. Describe in own words, do not copy and paste information from your official job description. Please note that the person indicated as your supervisor will receive an email to confirm your application for the event. Supervisor is an authorized official (e.g. director, head of department or similar within your organization) who supports your nomination to attend the event and understands that, if not stated otherwise, your institution takes the responsibility for logistics and financial arrangements (i.e. cover travel and accommodation costs, per diems, health insurance and visa, as needed). The above information will be treated as confidential and in an alignment with EU’s General Data Protection Regulation (GDPR). The personal data collected and recorded will be only used for the purpose of processing your application. It will be stored up to 5 years after this application is submited. I allow that photos of me are taken during the CEF event, and used on CEF websites, CEF social media channels or in CEF printed materials. The photos can be stored for up to 3 years after the event. In case of video recording or livestreaming I allow to be recorded in the audience. The recordings can be stored for up to 3 years after the event. I subscribe to the CEF Newsletter. I subscribe to CEF event invitations.